In an area renowned by walkers you can rent a penthouse apartment in a recently restored village farm house. Casa El Limonero with its breathtaking views provides the perfect "escape to the hills" for some peace and quiet. The apartment has two bedrooms , a spacious living room as well as an outdoor terrace and will comfortably sleep four. We have contrasted the old with the new, meshing an authentic village farm house with the conveniences of a modern living. During the summer months the local and well maintained pool is open and less than 5 minutes away . The Costa Blanca beaches are a 30-40 minute drive with shopping at Ondara's recently opened La Marina. Near by are golf courses, caves, water park, zoo, horse riding and plenty of night life in Denia or Javea if you want a change from the tranquillity of the mountains. Fleix is approximately a 70 minutes drive from either Valencia or Alicante airports and located in the rugged Marina Alta mountains of Eastern Spain. It is the middle village of the three villages that constitute the La Vall de Laguar community, these being Campell, Fleix, and Benimaurell. The Moors conquered and then settled this area nearly 1000 years ago bringing with them their distinctive culture, agricultural practices and introducing crops including lemons , cherries , oranges, apricots, almonds and olives. They cultivated and developed the mountain sides by building bancales. These stone walled terraces are still in use to date, planted with cherry trees, for which the area is renown. To defend their territory the Moors also built many castles and watchtowers, the ruins of which are still in existence today. Between 1609 - 10 the last of the Moors were expelled from Spain with local legend describing a last and dramatic stand on the ridge of the Cavall Verd. The valley was repopulated by people from the island of Mallorca in the early part of the 17th Century and today you will still find some families of Mallorcan descent such as Moll . The history of Casa El Limonero can be traced back to a centuries old La Vall de Laguar family and was built approximately 200 years ago as the home of newly weds from which they farmed the land. In the winter, as was typical a two centuries ago in Spain, animals lived with the family on the lower floors . On the upper floor there was a bread oven and racks to store and cure meat. By the late 1920's the house was no longer lived in and gradually slipped into a state of disrepair until we bought and restored this lovely old village farm house over the past few years so it could be lived in again . On the walls and in various nooks and crannies is evidence of the house's agricultural history living on. I live on the Kent coast with Yolanda and our two children. We have bought a home away from home in part of Spain that for us has the best of the countryside, stunning views of both the mountains and the sea and near to the beaches of the Costa Blanca. As you leave the motorway and start driving into the Marina Alta mountains you can't help but feel that you are in rural Spain. We have spent the last ten years slowly restoring Casa El Limonero a 200 year old village farm house which was completed early in 2011. Fleix and the Vall de Laguar are three small Spanish mountain villages full of character. Its not the beach, although they are not far away. There is plenty to do with the apartment only being a few hundred meters away from an ancient Moorish pathway the Barranc de l´Infern (Hells Ravine ), officially known as PR-V 147, revealing crystal-clear springs, caves and cliffs painted with UNESCO protected paintings of significant historical value along its length The walk is a closed loop of ~14.5 kilometres and has 6,873 stone steps more than 1000 years old. The views and wildlife are nothing short of spectacular. A second famous walk, PR-V 181, skirts the top of the Cavall Verd which is where the alledged last stand of the Moors in Spain occured . The architecture, countryside and the views make our home in Spain a special place. Mountain air, far from the crowds and a stunning view of the Mediterranean Sea. On a really clear day it is possible to see Ibiza from where many of the residents of the village originally came from. The climate is one of the area's greatest assets, with over 300 days of sunshine a year, little rainfall and a typical temperature range of 10°C to 20°C during the winter and 20 -35°C in the summer. As winter ends the almond and cherry trees burst into flower, with the cherry trees bearing fruit during May . There are hundreds of native plant species to the area and with such a diverse landscape it also provides an environment for a wide array of animals, such as rabbits, weasels, wild boar, mountain cats, foxes and birds of prey like the goshawk and tawny owl. The local festivals are held in January , May and September . On the 17th January the life of San Antonio Abad (St Anthony the Great) is celebrated by the communities that make up the Vall de Laguar. The Fiestas Patronales , patron saint festivals, begin in May with the celebration of the life of San Pascual (Fleix). In July Santa Ana (Campell) and St. Ignatius of Loyola (Fontilles) are honoured . In mid August, the feast of San Cosme y San Damián (Benimaurell) and early September Santa Teresa (Fleix) is honoured . Without any doubt Las Fallas de Valencia is a spectacular regional event. Its epicentre is the city of Valencia, one hour by car from Fleix. Although not celebrated in the Vall de Laguar many near by towns do, including Denia. The final firework display on the evening of 19th in Valencia is still to this day the best firework display I have ever seen. One bathroom with shower, sink and loo. The washing machine is also here. Spacious lounge with two sofa's around a coffee table which fold out into beds if required. Flat screen TV, DVD player as well as mini hifi with iPod/Phone docking station. Books, bookshelves and a wood burning stove for when it gets chilly. Modern kitchen with all major appliances including fridge-freezer , microwave , ceramic hob, oven and plenty of cupboard space. A built in breakfast bar divides the kitchen from the lounge. Oliva Nova Golf Club designed and built by Seve Ballesteros. It is an 18 hole par 72 links course of 6,350 m - 45 minutes away. Denia Marriott La Sella Golf Resort & Spa designed by the double Masters champion José María Olazábal in 1991. The course has 27 holes . A spa is located in the same complex. Notes on accommodation: The apartment is tiled throughout and easy to keep clean. If the windows are kept open there is usually a cooling breeze to stop you feeling too hot during the summer. The rear of the flat looks out onto the Laguar Valley and the sea with the front of the house forming part of the main and narrow village street. Cleaning / Towels / Linen / Maid service: Linen and towels are included and the apartment will be cleaned once a week. If more frequent cleaning is required this can be arranged for an additional charge. Other: A large outdoor terrace is an integral feature of the property and ideal for having a long lunch or dinner whilst looking out on a vista not to be forgotten. Vall de Laguar offers many impressive walking and biking routes. Ancient Moorish pathways such as the Barranc de l´Infern (Hells Ravine ), officially known as PR-V 147, reveals crystal-clear springs, caves and cliffs painted with UNESCO protected paintings of significant historical value along its length. The walk is 14.5 kilometers and has 6,873 stone steps of Moorish origin. A second famous walk, PR-V 181, skirts the top of the Cavall Verd which is where the alleged last stand of the Moors in Spain occurred. Denia - the north side of Denia has miles of sandy beaches, around 30 mins by car. Javea - The Arenal beach is the most popular, is sandy and is lined with shops and restaurants, around 30 mins by car. Moraira - Sandy cove type beach, Benidorm - Lovely sandy beaches, lots of shops, night clubs and restaurants. Fleix is equidistant between the airports of Alicante and Valencia. Travel time to to either airport is approximately 70 mins of which 40 minutes is motorway. A car is necessary to easily travel to Fleix. Inexpensive car-hire is available at both Alicante and Valencia airports. 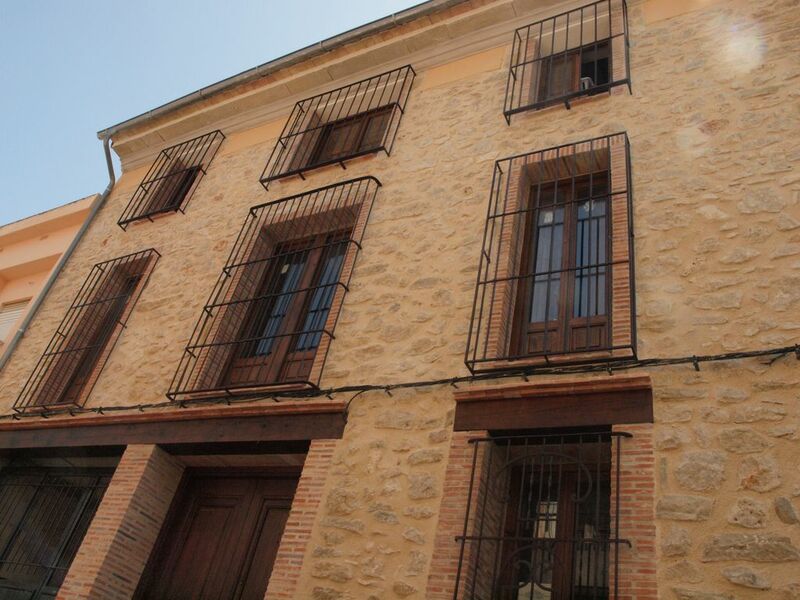 Casa El Limonero is in the middle of Fleix with access to a small number of shops for basic provisions. Orba is 15 minute drive , Denia a 30 min drive drive. The town of Jalon is around 30 mins drive where you can sample and purchase the local wine. The Terra Mitica Adventure Theme Park, Mundomar Dolphin/Seal Show, Aqualandia Water Theme Park and Terra Natura Animal Theme Park are at Benidorm approximately a 60 minute drive. If you visit in Feb you will see the cherry trees in bloom and in May you can pick cherries from our orchard, a 20 minute hillside walk from the village . During the middle of March , the 15-19th every year, is Las Fallas, a fiesta centred on the city of Valencia that has to be experienced at least once in a life time . The climate is one of the area's greatest assets, with over 300 days of sunshine a year, little rainfall and a typical temperature range of 10°C to 20°C during the winter. and 20 -30°C in the summer. The local festivals are held in January , May and September. On the 17th January the life of San Antonio Abad (St Anthony the Great) is celebrated by the communities that make up the Vall de Laguar. The Fiestas Patronales , patron saint festivals, begin in May with the celebration of the life of San Pascual (Fleix). In July Santa Ana (Campell) and St. Ignatius of Loyola (Fontilles) are honoured . In mid August, the feast of San Cosme y San Damián (Benimaurell) and early September Santa Teresa (Fleix) is honoured. There is a 24 hour Medical Centre. in Orba , a large hospital in Denia as well as a large Shopping Mall (La Marina) at Ondara. There are many good and independently run restaurants in the surrounding villages.